First of all I would like to thank Naheed Hassan from Indireads for sending out the ebook. ‘Done with Men’ is a light, short, delightful read. Although I am not into Chick lit romance, but I don’t think I was ever disappointed in picking up this book. It is a story of travel journalist Kairavi Krishna who is dealing with a recent breakup in the background of a long past of failed relationships. In hope of diverting her attention off the breakup, her friend and flat-mate, Baani, arranges an official trip to Goa. Unfortunately, Ricky, her ex-boyfriend, finds his way to the same resort with his brand new super-hot girlfriend, which brings her temper to whole new level. After a few vodka shots she heaves herself into a crazy series of events comprising of temporary hooking with a lesbian, getting a Done with men tattoo, parading around in a fluffy animal bikini, only to end up throwing herself down the balcony. She wakes up on a hospital bed to discover she has taken a fracture and is going to spend her new year alone in ward. And, that’s where something unexpected happens. She meets an orthopedist Dr. Vivian. At first she takes him for a dull, grumpy, heartless person, but soon her opinion changes completely. For a first time author Shuchi Singh Kalra has done a marvelous job. The writing style is wonderful, delightful, rich on humor, and certainly at par with most established authors from the genre. Language is good, unlike many first time Indian Authors who uses unprofessional and mediocre language. I really liked the concept of thought bubble that almost stands out as a separate character. The story has a good pace, and the excellent and frequent use of humor makes sure that the reader wouldn’t put the book down until it’s finished. I don’t remember if there was a moment in the entire story which I couldn’t enjoy. 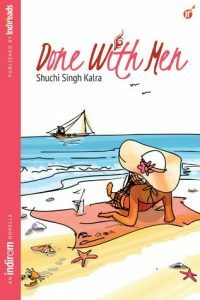 Overall, it is a great start from Shuchi Singh Kalra and I would recommend the book to all readers of Romance and Chick Lit. Well-deserved four stars!! !